A Maxar Technologies subsidiary has received a potential $3.2 million contract to design a payload technology for an Airbus satellite developed to support space-based data transmission efforts. MDA will develop preliminary designs, evaluate applicable tools and identify enhancement methods for the optical data relay payload of Airbus’ third SpaceDataHighway satellite, also called the European Data Relay System, Maxar said Thursday. The EDRS-D payload will be designed to increase the satellite’s speed and communications coverage across observation satellites, aircraft and other EDRS geostationary relay satellites at a distance of up to 46,602 miles. 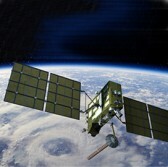 Tesat Spacecom will construct laser communication terminals for the satellite payload. MDA aims to begin the final two phases of EDRS-D node production and deliver by 2019. The current SpaceDataHighway satellite is built through a public-private partnership between Airbus and the European Space Agency. MDA also secured contracts for the production of EDRS-A and EDRS-C communications subsystems.